I admit that when I saw the press release, I was a little excited and when I saw that the price is about where most ~25Mbit connections are now I was even more ecstatic! $155 gets you 100Mbit cable with 150GB p/month, it even comes with an upgraded Cisco modem with a Gigabit Ethernet LAN connection. OK, granted it’s a bit pointless having a 1Gbit LAN connection to the network when your capped at 100Mbit, but it makes you wonder if this device was selected to mitigate the mass upgrade costs when other speeds become available, perhaps 200Mbit?, 500Mbit? heaven forbid they upgrade to 1Gbit?! As always, the data caps are still ridiculous. It’s day two of the plan change and upgrade and I’m already 20% through my 150GB allowance. And that’s just from testing and [yet again, another sale on] Steam. My initial testing shows some sick speeds, anywhere from averaging 6~8MB p/sec to 9.6~9.9 MB p/sec depemding on what your downloading and from where. 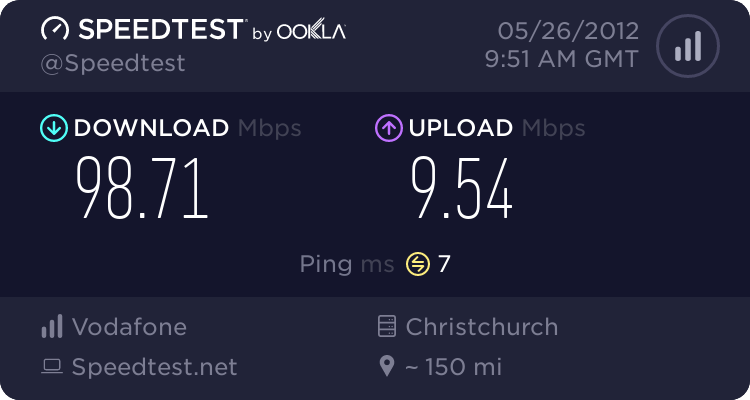 Speed tests are a mixed bag, most show 70-~80Mbits Download and 7~8 upload, whereas Telstraclears speed test seems to return 99.xMbits p/sec download and 9.xMbits p/sec upload. But as we know, these tests are generally “tweeked” for the best result under best conditions, but don’t always reflect reality. Time will tell how it goes as the service uptake increases, I’m fortunate that not many in my neighbourhood, or suburb will see the value given the price, but for me, it’s been a long time coming since the days of JetStart to get to here.